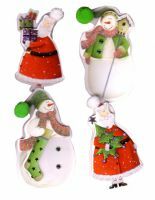 A pack of eight self adhesive, dimensional Christmas embellishments. These cute, layered embellishments will add a special focal point to any Christmas card design. The pack contains 2 each of 4 designs, 2 different Santa's and 2 different snowmen. Each one also has glittered areas and a cheeky pompom, just perfect for the holiday season.